Hypersensitivity vasculitis, which is usually represented histopathologically as leukocytoclastic vasculitis (LCV), is a term commonly used to denote a small-vessel vasculitis. There are many potential causes of hypersensitivity vasculitis; however, up to 50% of cases are idiopathic. 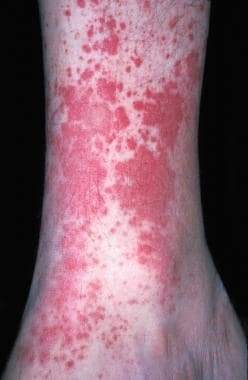 Hypersensitivity vasculitis may present clinically as cutaneous disease only or it may be a cutaneous manifestation of systemic disease. The internal organs most commonly affected in hypersensitivity vasculitis are the joints, gastrointestinal tract, and kidneys. Hypersensitivity vasculitis may be acute and self-limited, recurrent, or chronic. Overall, hypersensitivity vasculitis has a favorable prognosis, particularly when no internal involvement is present. Note the image below. Additionally, autoantibodies, such as antineutrophil cytoplasmic antibody (ANCA), may be associated with disease manifestations. In ANCA-mediated vasculitis, intracellular proteins from neutrophils become expressed on the cell surface, leading to formation of antibodies (ANCA). These autoantibodies then bind neutrophils, subsequently leading to neutrophil adhesion to vessel walls and cellular activation. Overall, however, the exact mechanisms causing hypersensitivity vasculitis remain to be elucidated. One third to one half of cutaneous vasculitis cases are idiopathic; the remainder have a variety of causes. Various infections may be associated with vasculitis. Upper respiratory tract infections (particularly beta-hemolytic streptococcal infection) and viral hepatitis (particularly hepatitis C) are most often implicated. Hepatitis C is a commonly recognized cause of vasculitis, likely secondary to the presence of cryoglobulins. However, when 1614 patients with hepatitis C were studied, vasculitis occurred in only 12 patients (9 with cryoglobulinemia, 3 without). Interestingly, cryoglobulins were present in roughly 40% of those tested; many patients with cryoglobulins (98%) did not have vasculitis despite an abnormal circulating paraprotein. Hepatitis B has been implicated in some cases of vasculitis in the past. HIV infection may also be associated with some cases of cutaneous vasculitis. Occasionally, ascertaining whether a drug (eg, antibiotic) or an infection (eg, upper respiratory tract infection) is responsible for the disease is impossible because the occurrence of vasculitis postdates both the infection and the drug therapy used to treat the infection. Foods or food additives may also cause vasculitis. Collagen-vascular diseases account for 10-15% of cases of cutaneous vasculitis. In particular, rheumatoid arthritis, Sjögren syndrome, and lupus erythematosus may have an associated hypersensitivity vasculitis. The presence of vasculitis often denotes active disease and possibly a poorer prognosis. Inflammatory bowel disease, ulcerative colitis, or Crohn colitis may be associated with cutaneous vasculitis. Several studies from Spain have been conducted on hypersensitivity vasculitis. [9, 10, 11, 12, 13] Hypersensitivity vasculitis reportedly has an incidence of 10-30 cases per million people per year. Henoch-Schönlein purpura (HSP), a small-vessel vasculitis characterized by deposition of immunoglobulin A (IgA) immune complexes, reportedly has an incidence of 14 cases per million people per year. Hypersensitivity vasculitis is reported most often in the white population, but epidemiologic studies are not available to assess whether hypersensitivity vasculitis is associated with any specific ethnic group or skin type. Hypersensitivity vasculitis may occur at any age. In both adults and children, Henoch-Schönlein purpura (HSP) may present in a clinically identical fashion to hypersensitivity vasculitis, and biopsy with direct immunofluorescence is typically needed to distinguish the two. HSP is a specific small-vessel vasculitis associated with the presence of vascular IgA deposition. However, by definition, HSP is a clinically defined entity and some authorities may make this diagnosis even if IgA deposition is absent. The classic tetrad of HSP consists of palpable purpura, arthritis, abdominal pain, and hematuria. HSP typically follows a respiratory infection and is more common in the pediatric population. The prognosis of patients with cutaneous vasculitis depends on the underlying syndrome and the presence of end-organ dysfunction. Patients with disease that primarily affects the skin and/or the joints have a good prognosis. Some patients develop a relapsing disease course, admixed with symptom-free periods. A subset of patients (< 10%) can develop chronic, unremitting disease with recurrent episodes of painful purpura and even ulceration, which can have a considerable impact on quality of life. [14, 15] There is increased morbidity and the potential for mortality if the kidneys, gastrointestinal tract, lungs, heart, or central nervous system are involved. Patients with granulomatosis with polyangiitis (Wegener granulomatosis), polyarteritis nodosa, eosinophilic granulomatosis with polyangiitis (Churg-Strauss syndrome), or severe necrotizing vasculitis have increased morbidity and mortality. Treatment with corticosteroids and/or immunosuppressive/cytotoxic agents is potentially a life-saving intervention. Mackel SE, Jordon RE. Leukocytoclastic vasculitis. A cutaneous expression of immune complex disease. Arch Dermatol. 1982 May. 118(5):296-301. [Medline]. Kevil CG, Bullard DC. Roles of leukocyte/endothelial cell adhesion molecules in the pathogenesis of vasculitis. Am J Med. 1999 Jun. 106(6):677-87. [Medline]. Fujikawa K, Kawakami A, Hayashi T, et al. Cutaneous vasculitis induced by TNF inhibitors: a report of three cases. Mod Rheumatol. 2010 Feb. 20(1):86-9. [Medline]. Lowry MD, Hudson CF, Callen JP. Leukocytoclastic vasculitis caused by drug additives. J Am Acad Dermatol. 1994 May. 30(5 Pt 2):854-5. [Medline]. Pendergraft WF 3rd, Niles JL. Trojan horses: drug culprits associated with antineutrophil cytoplasmic autoantibody (ANCA) vasculitis. Curr Opin Rheumatol. 2014 Jan. 26(1):42-9. [Medline]. Loricera J, Calvo-Rio V, Ortiz-Sanjuan F, Gonzalez-Lamuno D, Martínez-Taboada VM, González-Gay MA, et al. The spectrum of paraneoplastic cutaneous vasculitis in a: defined population. Medicine (Baltimore). 2013. 92:331. Jennette JC, Falk RJ, Bacon PA, Basu N, Cid MC, Ferrario F. 2012 revised International Chapel Hill Consensus Conference Nomenclature of Vasculitides. Arthritis Rheum. 2013 Jan. 65(1):1-11. [Medline]. Blanco R, Martinez-Taboada VM, Rodriguez-Valverde V, Garcia-Fuentes M. Cutaneous vasculitis in children and adults. Associated diseases and etiologic factors in 303 patients. Medicine (Baltimore). 1998 Nov. 77(6):403-18. [Medline]. Garcia-Porrua C, Gonzalez-Gay MA. Comparative clinical and epidemiological study of hypersensitivity vasculitis versus Henoch-Schönlein purpura in adults. Semin Arthritis Rheum. 1999 Jun. 28(6):404-12. [Medline]. Garcia-Porrua C, Gonzalez-Gay MA, Lopez-Lazaro L. Drug associated cutaneous vasculitis in adults in northwestern Spain. J Rheumatol. 1999 Sep. 26(9):1942-4. [Medline]. Gonzalez-Gay MA, Garcia-Porrua C, Pujol RM. Clinical approach to cutaneous vasculitis. Curr Opin Rheumatol. 2005 Jan. 17(1):56-61. [Medline]. Gonzalez-Gay MA, Garcia-Porrua C. Systemic vasculitis in adults in northwestern Spain, 1988-1997. Clinical and epidemiologic aspects. Medicine (Baltimore). 1999 Sep. 78(5):292-308. [Medline]. Chen KR, Carlson JA. Clinical approach to cutaneous vasculitis. Am J Clin Dermatol. 2008. 9(2):71-92. [Medline]. Fiorentino DF. Cutaneous vasculitis. J Am Acad Dermatol. 2003 Mar. 48(3):311-40. [Medline]. Sams WM Jr. Hypersensitivity angiitis. J Invest Dermatol. 1989 Aug. 93(2 Suppl):78S-81S. [Medline]. Zurada JM, Ward KM, Grossman ME. Henoch-Schönlein purpura associated with malignancy in adults. J Am Acad Dermatol. 2006 Nov. 55(5 Suppl):S65-70. [Medline]. Solans-Laque R, Bosch-Gil JA, Perez-Bocanegra C, Selva-O'Callaghan A, Simeon-Aznar CP, Vilardell-Tarres M. Paraneoplastic vasculitis in patients with solid tumors: report of 15 cases. J Rheumatol. 2008 Feb. 35(2):294-304. [Medline]. Fain O, Hamidou M, Cacoub P, et al. Vasculitides associated with malignancies: analysis of sixty patients. Arthritis Rheum. 2007 Dec 15. 57(8):1473-80. [Medline]. Xu LY, Esparza EM, Anadkat MJ, Crone KG, Brasington RD. Cutaneous manifestations of vasculitis. Semin Arthritis Rheum. 2009 Apr. 38(5):348-60. [Medline]. Piette WW, Stone MS. A cutaneous sign of IgA-associated small dermal vessel leukocytoclastic vasculitis in adults (Henoch-Schönlein purpura). Arch Dermatol. 1989 Jan. 125(1):53-6. [Medline]. Loricera J, Calvo-Río V, Mata C, Ortiz-Sanjuán F, González-López MA, Alvarez L, et al. Urticarial vasculitis in northern Spain: clinical study of 21 cases. Medicine (Baltimore). 2014 Jan. 93(1):53-60. [Medline]. Wisnieski JJ, Baer AN, Christensen J, et al. Hypocomplementemic urticarial vasculitis syndrome. Clinical and serologic findings in 18 patients. Medicine (Baltimore). 1995 Jan. 74(1):24-41. [Medline]. Callen JP. Colchicine is effective in controlling chronic cutaneous leukocytoclastic vasculitis. J Am Acad Dermatol. 1985 Aug. 13(2 Pt 1):193-200. [Medline]. Sais G, Vidaller A, Jucgla A, Gallardo F, Peyri J. Colchicine in the treatment of cutaneous leukocytoclastic vasculitis. Results of a prospective, randomized controlled trial. Arch Dermatol. 1995 Dec. 131(12):1399-402. [Medline]. Cronstein BN, Naime D, Ostad E. The antiinflammatory effects of methotrexate are mediated by adenosine. Adv Exp Med Biol. 1994. 370:411-6. [Medline]. Bangert CA, Costner MI. Methotrexate in dermatology. Dermatol Ther. 2007 Jul-Aug. 20(4):216-28. [Medline]. Keogh KA, Ytterberg SR, Fervenza FC, Carlson KA, Schroeder DR, Specks U. Rituximab for refractory Wegener's granulomatosis: report of a prospective, open-label pilot trial. Am J Respir Crit Care Med. 2006 Jan 15. 173(2):180-7. [Medline]. [Full Text]. Chung L, Funke AA, Chakravarty EF, Callen JP, Fiorentino DF. Successful use of rituximab for cutaneous vasculitis. Arch Dermatol. 2006 Nov. 142(11):1407-10. [Medline]. Harper L. Recent advances to achieve remission induction in antineutrophil cytoplasmic antibody-associated vasculitis. Curr Opin Rheumatol. 2010 Jan. 22(1):37-42. [Medline]. Lunardi C, Bambara LM, Biasi D, Zagni P, Caramaschi P, Pacor ML. Elimination diet in the treatment of selected patients with hypersensitivity vasculitis. Clin Exp Rheumatol. 1992 Mar-Apr. 10(2):131-5. [Medline]. Tancrede-Bohin E, Ochonisky S, Vignon-Pennamen MD, Flageul B, Morel P, Rybojad M. Schönlein-Henoch purpura in adult patients. Predictive factors for IgA glomerulonephritis in a retrospective study of 57 cases. Arch Dermatol. 1997 Apr. 133(4):438-42. [Medline]. Callen JP. Cutaneous vasculitis: Relationship to systemic disease and therapy. Curr Probl Dermatol. 1993. 5:45-80. Ekenstam Eaf, Callen JP. Cutaneous leukocytoclastic vasculitis. Clinical and laboratory features of 82 patients seen in private practice. Arch Dermatol. 1984 Apr. 120(4):484-9. [Medline]. Histopathologic features of leukocytoclastic vasculitis. Urticarial vasculitis. These lesions differ from routine hives by lasting longer (often >24 h), being less pruritic, and often resolving with a bruise or residual pigmentation. Erythema elevatum diutinum, a rare cutaneous vasculitis. Disclosure: Serve(d) as a director, officer, partner, employee, advisor, consultant or trustee for: Abbvie.